We ask interested parties to complete a brief interest survey. This allows us to assess the sincerity of the applicant and provides us with a veterinary referral and other pertinent background information. All you have to do is agree to take a minimum of two cats, fill out an adoption application, and have a barn site inspection. After we receive and approve your application, you will receive a set of guidelines from the agency supplying the cats explaining how to acclimate the cats into your barn. After your application is approved and a site inspection is satisfactorily completed, a kitty playpen, bedding, litter-box and food dishes, provided by the agency supplying the cats, will be set up in your barn. The cats are kept in the playpen for two to four weeks. This allows the cats to bond with their new caretaker and become familiar with their new surroundings. If possible, after the confinement period, the cats should have a room or a stall that is completely enclosed for them to be released into and that will enable you to keep them in at night. All cats have been spay/neutered! You'll never have to worry about endless litters of kittens appearing on your property. At least 1 round of Rabies and Distemper vaccines; often, these cats have had their booster vaccines as well. All have been given at least 1 round of a comprehensive de-flea/de-worm/ear mite treatment, often receiving more than 1 round while in our care. At least two cats from one colony should go together. They have bonded with one another and the move will be less traumatic. Adjusting to their new home will be easier if they have the security of a familiar companions. The semi-feral kitty has adapted to sharing space with humans with little fear or stress, but still prefers not to be patted or held. Generally, they are happiest and more confident in the company of other cats as they were once a part of a feral colony. It is particularly difficult for semi-feral kitties to acclimate to new places and people. They require a lot of patience and understanding of their needs. They may never become a domesticated lap cat. If you decide to take a semi-feral cat for your working barn, we ask that either you take two, or that they join an existing group of barn cats, as these cats need to be around other cats. Indoor/outdoor cats may be friendly. Agency volunteers can tell you if specific animals can be handled. Some feral cats learn over time to accept human attention. However, most animals that agencies adopt out as barn cats are unlikely ever to become household pets. Do you have a working barn or a safe, heated outbuilding? If so, these cats need you as much as you need them! Establishment of barn cats or feral colonies in rural areas benefit farms and ranches with rodent control, but the cats must still be regularly fed to keep them healthy. Healthy cats engage in rodent control, whereas starving or unhealthy cats do not. Barn cats need safe, permanent outdoor homes with one or more areas of weather-proof shelter and a continual source of food and clean water. They thrive on rural or semi-rural properties where they can put their natural hunting abilities to good use. Owners of dairy farms, stables and other properties where grain is stored will confirm that cats are a must to avoid rodent infestations! Those that tolerate human companionship also do well in homes where they can spend most of the time outside but can come indoors for food and warmth in severe weather. Note that removing feral cats and relocating them is a labor-intensive process on the receiving end. The cats must be fed daily and safely contained for two to four weeks before their release in that area. This helps them learn to recognize their new home and know where to return for food and shelter. Most barn cats are extremely timid and fearful of people. Unless you have experience handling wild cats, do not attempt to touch them. Call a veterinarian or agency volunteer for advice if a barn cat becomes sick or injured. Our barn cats will be delivered to their new homes by a volunteer. Agencies provide barn cats with a large crate or cozy "cat playpen" to live in for the first few weeks of life in their new location. The crate allows the cats to acclimate to their new home without the danger of having them run away in search of their old home. They also provide a litter box, bowls and startup food to assist in the relocation process. A secure place to keep them for the first 2-4 weeks, while they acclimate to the barn and environment. This can be a tack room, stall or any secure indoor enclosure that they cannot escape from. Agencies will lend you an introduction cage if no secure area is available. 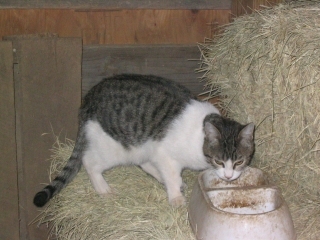 They will also offer all the guidance, advice and information you need if this is your first time adopting a barn cat. The new caretaker Must be interested in providing a good home. A country home only occupied on weekends is not acceptable. The cats need daily food and water. People must agree to provide basic needs, including veterinary care if necessary and sign an adoption contract (agreement) similar to one used for domestic cat placements.